7" vinyl with the original version on the A-Side b/w K-Def Remix on the B-Side! Full jacket artwork designed by HOT16 himself! 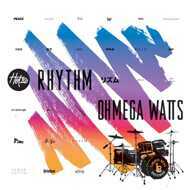 Portland, OR producer HOT16 continues his recent run of quality releases with his new 7” single, ‘Rhythm’, which features guest vocals from Ohmega Watts, and a b-side remix by the legendary K-Def. ‘Rhythm’ is not only an ode to the music that moves the body, but the vibe that connects us all, beyond barriers of language and nationality. K-Def blesses the b-side with an amazing remix that ups the tempo, and uses bass, horns, and strings on top of a driving breakbeat to create a darker tone that brings out the seriousness behind Ohmega’s message. ‘Rhythm’ is a funky, soulful record that captures the spirit of the golden era of Hip-Hop, without ever sounding retro or throwback. This is what good Hip-Hop sounds like in 2016 and beyond.